I must have been a precocious child. When small my heroes were the great engineers, men like Watt, Trevethick and Hackworth being held in similar esteem to that reserved by my peers for Superman, Batman and Rocket Robin Hood. The collective company of Stephensons or kingdom of Brunells were the gods themselves having taken on mortal form. Gooch, Bulleid, Dean, Stanier and of course, Gresley were on the third tier in the pantheon. I could recite the names of their locomotives, detail their innovations and failings and give a passable explanation of the differences between low- and high-pressure steam. Being able to tell Pen-y-Darren apart from the Coalbrookdale locomotive would take a little longer. It must have been 1969, because it was a school holiday, and school holidays meant a visit to The Museum of Applied Arts and Sciences on Harris Street, a brick edifice with the entry stair straddled by a large lunar landing module. I was a bit of a regular there over the years (to use a bit of the laconic understatement we Australians are famous for), but on this one occasion I must have been particularly well behaved for my reward was a book from the museum bookshop. No kiddie book for me, I selected Simmons’ Railways 1: To the end of the Nineteenth Century, published by HMSO on behalf of the Science Museum. Clutching my prize, we hurried home. That night, my long-suffering mother began to read it to me and there, on plate 6 was Rocket. “But that’s not Rocket!” I remember exclaiming. “Rocket has inclined cylinders and where’s the wooden lagging?”, I asked, or something like that. Mum patiently explained that the cylinders had been moved to improve efficiency and the lagging had probably been taken off so you could see the boiler properly in the museum. “But Rocket didn’t have a smokebox”, I protested, unconvinced. Many years have passed, I still have my book although the binding isn’t as tight as it once was, and there appear to be Vegemite stains on a couple of pages. To this day, I remain convinced that the Rocket that started work on the Liverpool to Manchester line in 1830 is different to Rocket of the 1829 Rainhill trials, and different again in major ways to the corpse preserved in the Science Museum in London. Imagine my surprise, then, when perusing an old Scientific American on Project Gutenberg the other day, to find SA in October 1884 claims from The Engineer that the three are different locomotives. I’ve reproduced the substantive parts of that article below. Bottom: Rocket 1830 – Sketch by Mr. Nasmyth, September 12, 1830. Hitherto it has always been taken for granted that the alteration consisted mainly in reducing the angle at which the cylinders were set. The Nasmyth drawing alters the whole aspect of the question, and we are now left to speculate as to what became of the original Rocket. We are told that after “it” left the railway it was employed by Lord Dundonald to supply steam to a rotary engine; then it propelled a steamboat; next it drove small machinery in a shop in Manchester; then it was employed in a brickyard; eventually it was purchased as a curiosity by Mr. Thomson, of Kirkhouse, near Carlisle, who sent it to Messrs. Stephenson to take care of. With them it remained for years. Then Messrs. Stephenson put it into something like its original shape, and it went to South Kensington Museum, where “it” is now. The question is, What engine is this? Was it the Rocket of 1829 or the Rocket of 1830, or neither? It could not be the last, as will be understood from Mr. Nasmyth’s drawing; if we bear in mind that the so-called fire-box on the South Kensington engine is only a sham made of thin sheet iron without water space, while the fire-box shown in Mr. Nasmyth’s engine is an integral part of the whole, which could not have been cut off. 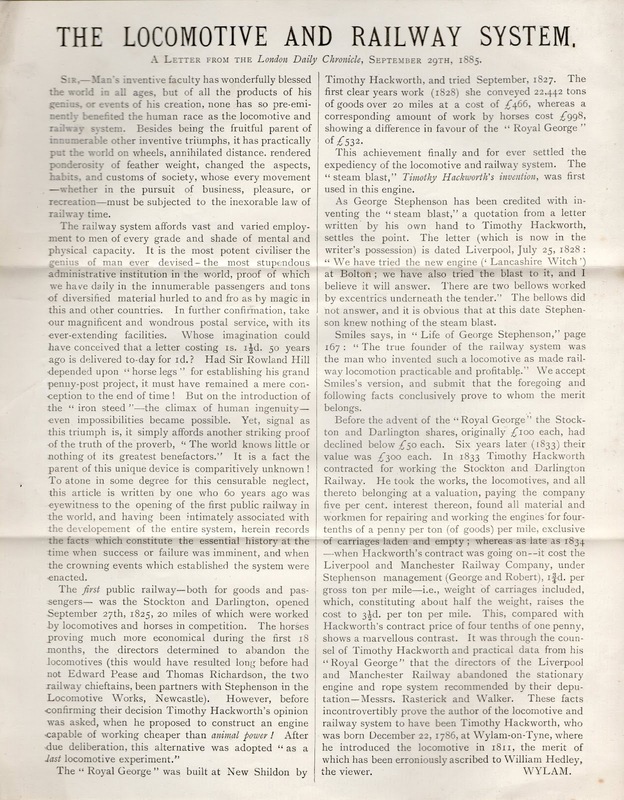 … In “Wood on Railroads,” second edition, 1832, page 377, we are told that “after … the Rainhill trials… were concluded, … Mr. Stephenson had also improved the working of the Rocket engine, and by applying the steam more powerfully in the chimney to increase the draught, was enabled to raise a much greater quantity of steam than before.” Nothing is said as to where the new experiments took place, nor their precise date. But it seems that the Meteor and the Arrow— Stephenson engines— were tried at the same time; and this is really the only hint Wood gives as to what was done to the Rocket between the 6th of October, 1829, and the 15th of September, 1830. About mid-day, the “Rocket” was at rest for about an hour near where I stood; and I eagerly availed myself of the opportunity of making a careful sketch of the engine, which I still preserve. As an engineer himself with experience building steam carriages and locomotives, Nasmyth is unlikely to have mistaken one locomotive for another, particularly when he was aware of the significance of Rocket and went to Liverpool expressly to see the locomotive. The mistake is especially unlikely when the locomotives all had nameplates. Nasmyth is quoted in George Stephenson’s biography by Smiles (1858) that the opening parade was led by George Stephenson on Rocket, but later accounts (for example, Frederick S. Williams (1883, 2ed), Our Iron Roads) say George was on Northumbrian and Joseph Locke was driving Rocket. Notably, the later accounts can’t even agree on which number each locomotive carried in the opening parade. Our options then, are that Nasmyth claimed contact with Rocket to bask in the reflected glory and make a better story than had he just said he saw Northumbrian (he does have some form, having embroidered his involvement in commercialising the steam hammer into a claim of inventing it outright) or; there was some sort of conspiracy between the Stephensons to mislead a business rival into believing he had seen Rocket even though they were apparently unaware of his journey until he arrived in Liverpool and it would have involved changing nameplates (they weren’t above misrepresenting themselves to gain advantage – also see below) or; the journalists (who at the time frankly wouldn’t know a locomotive engine from the back end of a winding engine) muddled the account and confused the names and numbers. Rocket in the Science Museum in London. Note wooden driving wheels, the modern smokebox, but also the way the firebox (sans wrapper) is the older type that is external to the boiler and the wheelbase appears shorter than in Nasmyth’s sketch, but similar to the 1829 drawing. Robert Stephenson never showed much imagination with his locomotive names, tending to reuse popular ones over and over again. While we know Meteor was working on the Liverpool and Manchester Railway from 1830 until at least 1835, another Meteor (this one a Planet class 2-2-0) ended up being sold to the Boston and Worcester Railroad in the USA in 1832. B&W also purchased a Sampson-class 0-4-0 locomotive from Stephenson called Rocket, in 1836. Maybe it was cheaper getting nameplates cast in bulk. There may have been other Rockets not otherwise recorded. We also know that the L&MR Meteor was called Wildfire when purchased, and the name was changed prior to opening of the line so I wouldn’t be too surprised if Northumbrian ran around with Rocket nameplates for a while. 2-2-0 Planet-class locomotive on the B&W, believed to be Meteor, at the end of its working life about 1867. Smithsonian photograph. The Robinson Crackpot Theory™: In the end, I think Rob Stephenson pulled the old “two Rockets” trick. 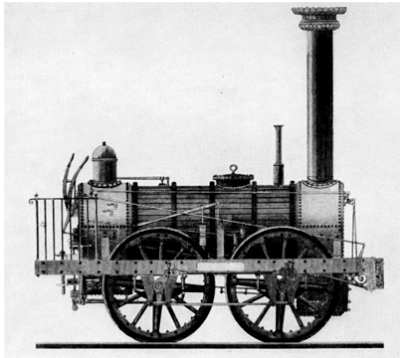 An experimental locomotive built in 1829 for the Rainhill trials with wooden wheels, inclined cylinders and a multiple firetube boiler, basically designed to game the competition rules which favoured a light locomotive of moderate power that could manage a fair turn of speed. This was then modified in the months following the trials to have a smokebox to improve the draught, and horizontal cylinders to improve the crank efficiency. Following successful testing, the test unit was hauled out the back of the shed and had a tarp thrown over it. Parts like rods, lagging, nameplates, firebricks and some of the firebox were probably recovered, and used on a new-build Rocket made the same as the others in the Northumbrian class with cast iron wheels, an improved smokebox, horizontal cylinders and a water jacket firebox. This then gives you a fleet of eight identical 0-2-2 locomotives with interchangeable parts to simplify maintenance. The last thing you want on a high-profile line under the scrutiny of both shareholders and parliament is an experimental locomotive that was built in a rush and that someone’s been mucking about with for months after. Rocket v2.0 of 1830 then did the hard yards on the L&M before being converted to Lord Dundonald‘s Rotary Engine in 1834, sold to Lord Carlisle in 1836 for his mineral railway and was later used to power a steamship, then a small machinery shop in Manchester, then a brickyard, before being purchased as a curiosity by a Mr Thomson, of Kirkhouse, near Carlisle, who sent it to Messrs. Stephenson to take care of, where it allegedly remained for some years. When it was decided to donate Rocket to the museum in 1862, I reckon the Stephensons checked under the tarp, realised Rocket v1.1 of 1829 was in more presentable nick, put some name plates back on and shipped that one off to the museum instead. Too bad that the connecting rods, firebricks, brass dome and copper firebox wrapper had long gone. What was left of poor old Rocket v2.0 of 1830 after 30-odd years of abuse was probably then scrapped to hide the evidence. On the balance of probability then, I think the Science Museum’s Rocket is Rocket of the Rainhill Trials, as modified by Robert from 6 October 1829 through to 15 September 1830 to try to work out how to make a workhorse, rather than a show pony, but never ran in revenue service on the L&MR. The firebox and sudden re-appearance of the wooden driving wheels have me convinced this is the experimental one. While we’re on the subject of controversy, the cylinders of one of the other Rainhill entrants, Hackworth’s Sans Pareil were cast at Stephenson’s works. The specification was for the casing to be 1½ inches thick but the casings supplied were only 5/8 inch. One cylinder burst and as a result the Sans Pareil did not complete the course. We’ll ignore that Sans Pareil when fueled and watered weighed some 4 hundredweight above the maximum weight permitted in the rules. Another problem was the prodigious fuel consumption due to the strength of the steam blast blowing much of the fire up the funnel. In the 2005 reenactment of the Rainhill Trials by the Manchester Museum of Science and Technology and the National Railway Museum, Rocket won, this time without the need for industrial sabotage. 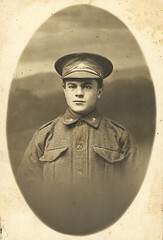 Timothy Hackworth’s Sans Pareil. My photo, I doubt the blue nylon rope is original. It seems Smiles was a poor biographer and his 1858 work borders on hagiography instead. I missed the section where it claims George Stephenson invented the blast pipe. While Rocket did have a blast pipe at the Rainhill Trials, so did Hackworth’s Sans Pareil and letters exist showing Stephenson did get the idea from Hackworth, who had taken it from Trevethick in 1827 while building the Royal George for the Stockton and Darlington Railway. The point was not missed on the writer of this letter to the London Daily Chronicle, September 29, 1885.